Every grammar school arranges their own parades and the children parade, class by class. The parents are cheering from the sidewalk. The Royal Family greets the parade from the balcony. Dressed in their finest and waving to the crowd. This is their salute to the people. 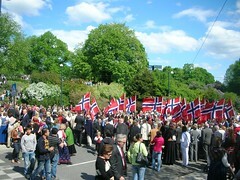 17th of May parade with flags and a cheering crowd. To the right: look at the little boy on his father’s shoulder! 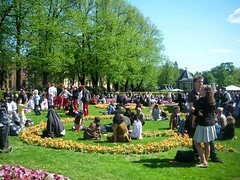 Above: some of Oslo’s parks. 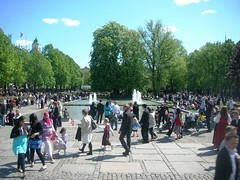 Below: Some of the fountains. 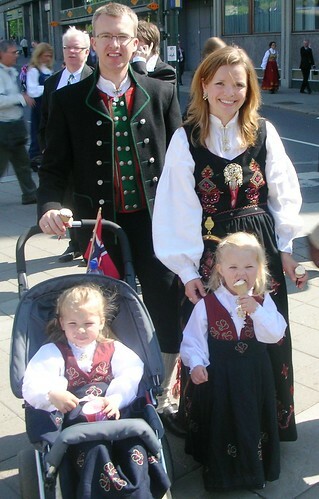 Left: A family not in Bunad. Right: Some teenagers. One could write a book or more about this day, but I have only one post and tried my best to share some of the key points to understand our tradition. You might say it is patriotism or nationalism, but then I would say in a very harmless and positive way. We don’t think we are better than others, have won anything or have any opponents. We’re just happy to be one free nation in peace and that it’s okay to feel good and to show it. To enrich the subject, I would love to hear your thoughts and opinion in comments! You really get around in that busy crowd and bring out the best in everything to share with me, and the rest of the world. Quite simply, a lovely post! Thanks my dear and thanks also for coming over and live with me so I could share moments like this with you in person! Oh you Norwegians really know how to capture the spirit ! That is a crowd I’d really enjoy to be in. Your welcome the 17th of May next year Jaffer! 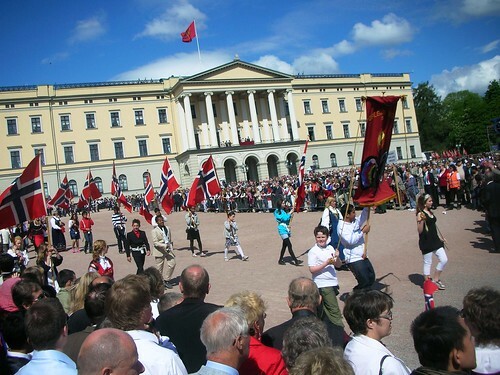 Happy National Day to all Norwegians! Love the Bundad traditional folk costume. They look pretty on the ladies. You are having lovely weather in Norway now. Great looking family in traditional costume ! Great post! What a difference nice weather makes to the day. And isn’t the timing (most years) fabulous? Release from the grip of winter is cause for celebration in its own right, I think. Thank you for the greeting, it I’m a bit belated.! You seem to have covered it all – as it should be. Hope you had a wonderful May 17! I love the photos of the traditional clothes. Beautiful! How cool!!! 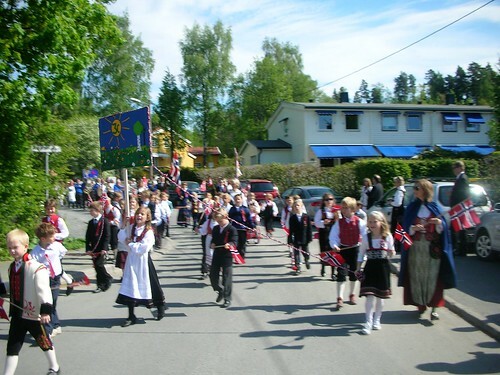 You Norwegians have a lot of parades and it’s truly a sight to behold! :) Awesome! what a wonderful coverage Renny!! I can see you had a great celebration! Lovely bunad’s! 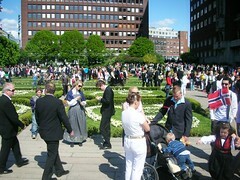 Its so nice to see so many people out in the sunshine enjoying themselves, and so happy looking. I’m loving the traditional outfits, so lovely to see pride in heritage. Happy May 17th! I’m thinking what a fabulous country you are living in – we’re hoping to visit one day in the future. Wow! Looks like quite a celebration! Everyone is so festive! Great post Renny, you always have such interesting and unique material here ! 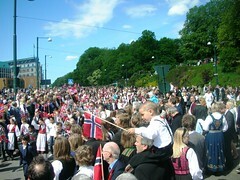 This years parade in Oslo was nothing less than fantastic. And one of the longest for many years: 108 schools did participate with more pupils than normal. And the weather, fantastic. The Norwegian traditional folk costume look beautiful. Gripping and makes one feel the spirit of the moment. That’s a wonderful occasion. It’s nice to see a lot of people especially the kids actively participating. Sounds a lot of fun this day! I think you captured and telling very well the atmosphere of the parade and crowd. Bunads are very nice. Of course as you ask to speak about our feeling reading your post, I think things are very different in France since people are a sort of melting pot now with different cultures, social referent, and more than 72 millions of people on our space. It isn’t a paradize but finally year after year sounds we are more receptive each others. I understand Sarkosy has an impossible job! Making all these different people go all in the same direction! Impossible mission! You know it is so since Astérix, le Gaulois! It’s especially impressive that so many people take the trouble to wear traditional costumes. It looks so effective, so celebratory. There can’t be very many countries where people would turn out at an event wearing national dress, I don’t think. I’m wondering if people own these, or are they hired? It’s particularly great to have had such a beautiful day. @All: Thanks for your comments and reflection – it means a lot to me and enriches the subject! @A.: The Bunads is privately owned, often sewed by relatives (from their original aria or home province) and given as a confirmation gift. What a gorgeous day you had! Thank you for sharing it with us. I love it when you post about the History of Norway! I always knew that Norway (along with other Scandinavian countries) were very democratic since the 19th century (we learn this in our History classes) and that it was a model to follow (although Portugal has failed to do so in so many aspects). Oh my God, what a gorgeous family! Their outfits (Bunad) are so beautiful! I simply loved them. I like this kind of patriotism, for one should be proud of its country, its history and culture – after all it is all part of whom people are (their identity) – so, I congratulate Norway for its amazing and positive love for the nation. huh, how nice. Sort of like Japan’s children’s day and a Heritage week and national celebration like Canada’s all rolled together. That is social engineering. I do not like social engineering. There are better ways for women to rise, ways that may take longer, but ways that more honorably apply the principles of equality and fairness. Whatever ways that remain unjust which are preventing women from rising fairly in male-dominated environments are also wrong and must change, as they will in time. There are important lessons for individuals and for society to learn and work through during that more natural social adjustment. Very interesting! 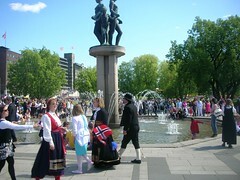 I will be taking my first trip to Norway in May and cannot wait to experience this special day in Oslo! Thank you for sharing all of the info and photos! Renny, what a wonderful post and great pics! 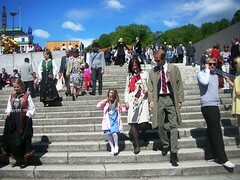 I hope someday to be in Norway on the 17th of May to celebrate with my cousins. In the meantime, I wish you the best from Arizona…keep up the great blogging!